The African giant pouched rat (Cricetomys gambianus) looks like a big rat, though it is not a ‘true’ rat; it belongs to a different family (Nesomyidae) from the ordinary house rat (Muridae). These giant pouched rats grow to three feet long (including the tail), or about the size of a household cat. They are forever sniffing, sniffing, sniffing with their nose that has fifty times as many scent receptors as our own. Belgian rat enthusiast Bart Weetjens loved playing with his pet rats when he was a boy. As a student at university he realised that these creatures might have the right combination of light weight, sensitive nose and sufficient intelligence to be trained in a truly life-transforming skill: detecting buried land mines. These hideous mines litter the countryside in various parts of the world that have suffered conflict in the last fifty years. They have maimed and killed villagers in Tanzania and Cambodia and many other countries long after warring factions have moved on. They can be cleared only by painstaking search operations which, when carried out using metal detectors, are slow and expensive. 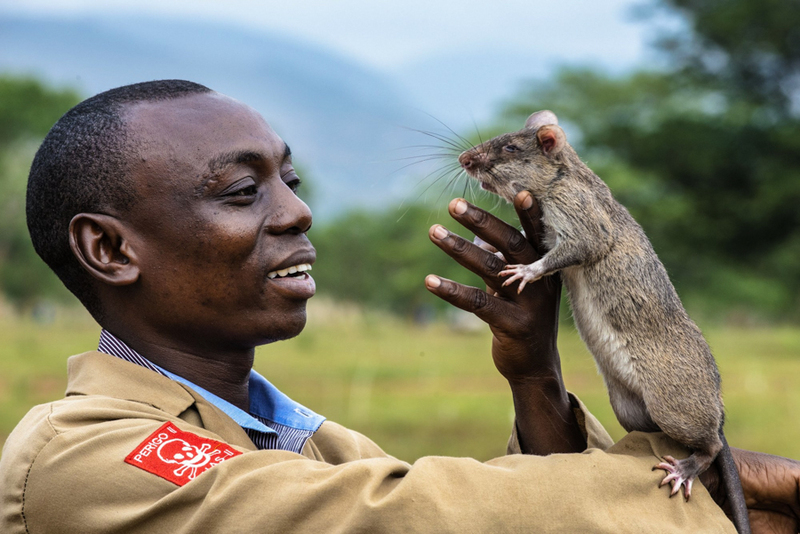 The mine-detecting rats are trained from a young age to respond to the smell of TNT, the explosive most commonly used in land mines. The television programme showed them interacting with their handlers who treat them with the same kindness you would see for any household pet in a good home. The rats are not themselves in danger from the mines because their bodies are sufficiently light. Once trained, they pursue their mission in close company with a handler who guides a pet rat over a patch of ground in a systematic search, using a lead. The rats go sniff sniff sniff, sniff sniff sniff all the time as they experience their surroundings largely through smell and hearing. Their eyesight is not strong. When the searching rat smells TNT, it lifts its nose in the air and begins to scratch the ground. The handler clicks a clicker to signal to the rat that he can come and get his reward: nuts or bananas or other treats. Watching all this, I was profoundly moved and mesmerized by the beautiful partnership of human and humble creature, helping us undo the harm that others of our species had done. It was a combination of science and compassion, sense of justice and friendship, and the result is tremendous. A rat with his handler can check, in 20 minutes, an area that would take days for a human with a metal detector. This is partly because the rat senses the TNT itself and will not be distracted by other buried metal objects. These rats have now helped to check or clear large tracts of land and their success has been celebrated and is being exported around the world. Gotta watch this! Hope it is available somewhere online. Landmines are a huge problem but seldom capture our attention. I like the theme of partnership.